It’s about making information more accessible and easier to find. We hope that this new platform will allow you to find the CGA news you need – and fast. Let’s take a tour. The main way to navigate is though the navigation bar at the top of the page… this will appear on every page throughout our website. The Home Page offers the main navigation for the whole site, as well as key updates from other areas such as Upcoming Events and Recent Posts. This page can be used to search the entire site for infomation or search posts by category. You can join CGA , subscribe to the blog, or subscribe to the email list from the home page. Near the bottom of the page, you can click on an authors name to read their posts or even view archived posts by date. And of course, there is a contact us link. Play around with the different links to get used to where they go. Search for that newsletter article on summer camps that you couldn’t find or about that program you were interested in. 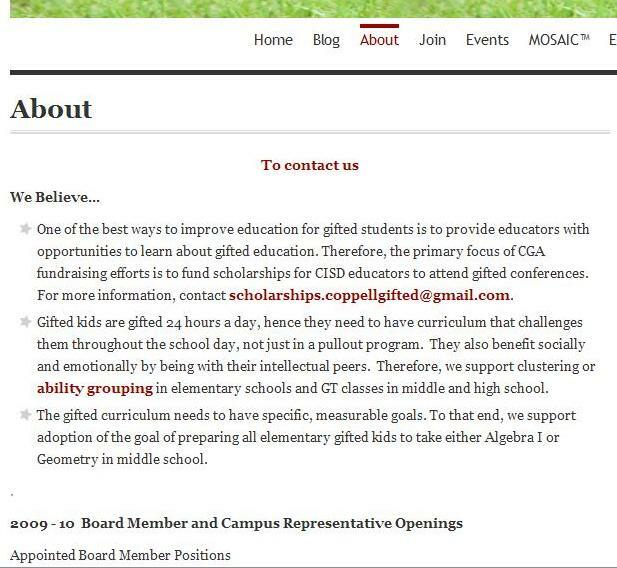 Let’s keep working our way through the site with a visit to the newest part of Coppell Gifted Association’s website, The Blog. This is where you get to hear and be heard. We’re so excited about offering a blog as a place to encourage conversation about gifted education, programs, events, books, and many other areas. Here’s the important thing about the blog: We want to hear from you! CGA pride s itself on being relevant to our membership, so use this blog as a forum to let us know what’s good and what needs improvement. Share your MOSAIC stories as a comment under the MOSAIC post. 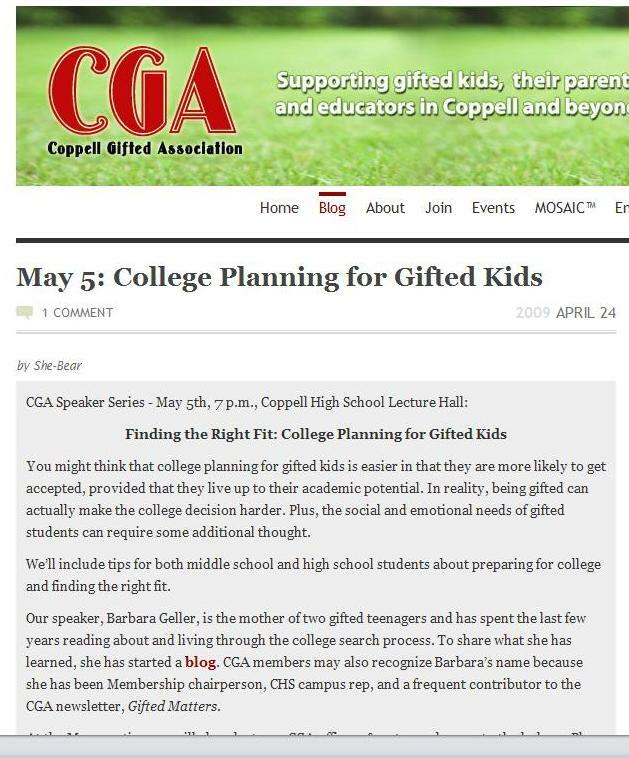 Let us know what you thought about College Planning for Gifted Kids under that post and offer insights on things that worked well for your children. Share your stories and encourage others by commenting on the AP Proctor post. The Blog is our place for community, conversation, and information. You will need to create a WordPress ID to be able to post comments. We hope to hear from you soon! About section talks about the beliefs of CGA, lists open board positions, and offers volunteer opportunities. We hope you’ll take the time to peruse this section to better understand our beliefs and see if you can fill one of those needs for board members or volunteers. Join page is pretty self explanatory. 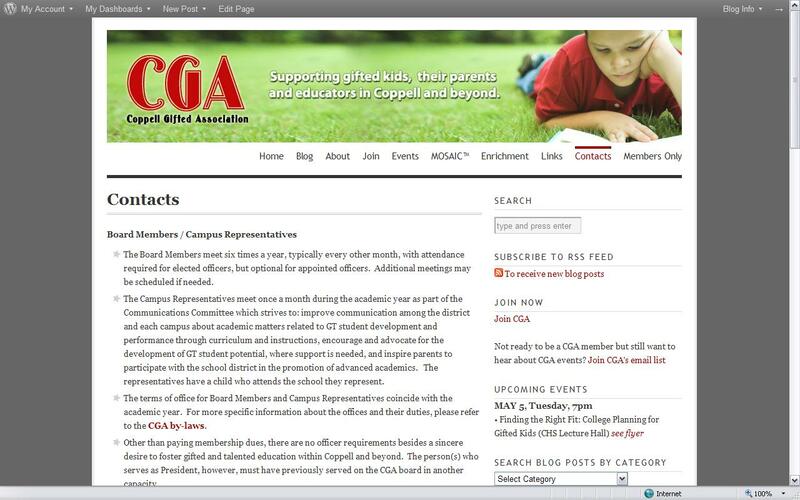 In addition to joining CGA, it offers ways to get information through Facebook, blog subscription, and more. Events is a listing of all upcoming events complete with a link to a calendar for those of us that are visual. The MOSAIC page is for everything MOSAIC, both during the school-year and summer. Find class schedules, course details, instructor bios, registration information, competitions, and more. See pictures from previous MOSAIC events and even order the book from the Creative Writing Contest. And, best of all, leave your comments about MOSAIC events. This will be your new go-to resource for everything MOSAIC! Enrichment is a wealth of information on opportunties both during the school year and in the summer. It suggests activities for home, here locally, and even on a national level. Check this section out and be sure to leave your recommendations in the comments section. Links is definitely a page to bookmark (not that you weren’t doing this for the whole site)! Resources abound with links to school board agendas, programs, and organizations. Share your favorite GT sites as well in the comments section. Contacts is where you’ll find your campus reps and board members, along with their email addresses. Current volunteer openings will also be posted there. Get involved today! Members only is a password protected section that is only accessible to current CGA Members. We’ll post contest results there and communicate information to the general membership. Members will also be able to view the newsletter prior to the general public in this special session. This will be the place that CGA members can preregister for MOSAIC student enrichment programs during the year like Rocketry, Chess, and Creative Problem Solving. One more reason to join CGA today! That’s it! We hope that you’ll find this site informative and easy to navigate. We’d love to hear your thoughts and ideas on programs, books, speakers, curriculum, and anything else related to gifted education. So, please use this site interactively and engage with us in this journey.